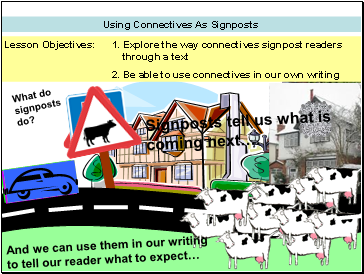 Signposts tell us what is coming next…. Read at the letter from a resident to a local paper. 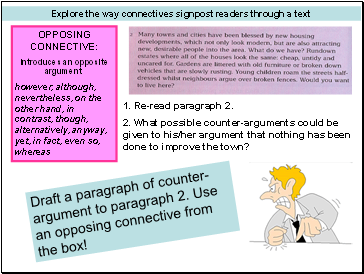 How does s/he signpost us through his/her argument? Shows the order of your points. Introduces a result or solution. Which type of connective does this writer NOT use? 2. What possible counter-arguments could be given to his/her argument that nothing has been done to improve the town? Draft a paragraph of counter-argument to paragraph 2. Use an opposing connective from the box! Imagine the anonymous letter was written about the area that you live in. Write a letter of reply to your local newspaper, arguing that your town is a great place to live. Write in paragraphs so that I have a clear structure. 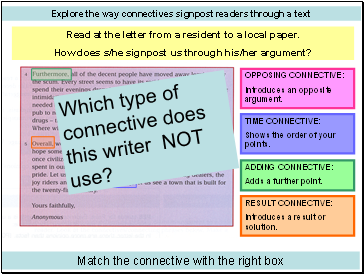 Use a range of connectives to signpost my readers through my points. 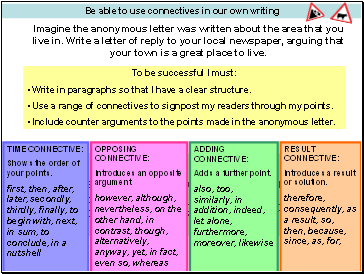 Include counter arguments to the points made in the anonymous letter.